The United States implemented the Marine Mammal Program in 1960 with the purpose of training sea mammals to assist the U.S. Navy primarily with underwater mine detection. The mammals best suited for this job were the bottlenose dolphin and California sea lion. 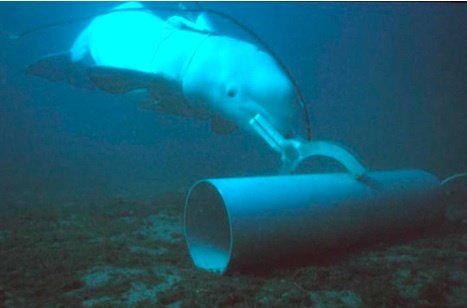 Today the Navy continues to care for and train sea mammals (including Beluga whales) for various underwater missions. A trained bottlenose dolphin named K-Dog leaps out of the water during a training exercise in the Persian Gulf. Petty Officer 1st Class Bria Aho, US Navy. “Military-trained marine mammals, including dolphins, can detect underwater mines and intruders. It’s unclear how the Russian navy intends to use these “combat dolphins,” although state-run Russian news agency RIA Novosti reports that the mammals will be getting equipment upgrades. A beluga whale marks a training target Nat. Geographic. Directions: Ask students to examine the title of the post and of the actual article they are about to read. Then, have them examine the photos. Ask students to write a paragraph describing what they think this article will discuss. Have students use the pre-reading organizer by TeachEm2Think to assist them in finding the main ideas from the reading. Military-trained marine mammals can detect underwater mines and intruders. It is reported that mammals will be getting equipment upgrades. These animals have the ability to to detect and find targets in murky water. The U.S. Navy trains its marine mammals to find and retrieve equipment lost at sea. Mechanical systems can be overwhelmed by all the competing signals, but not dolphins. A dolphins’ sonar is finely tuned. Handlers give a sea lion an attachment system it can hold in its mouth and send the mammal overboard. The Navy deployed dolphins and sea lions to patrol the area. Sea lions also have the advantage of being amphibious. The ability of these animals to detect and find targets at depth or in murky water is something technology can duplicate. The Sevastopol-based “combat dolphins” are trained to search for and tag underwater mines. The U.S. Navy trains its marine mammals—including California sea lions and bottlenose dolphins—to find and retrieve other sea creatures lost at sea. Sea lions are better than any machine as far as detecting mines. Researchers now understand how dolphins can detect mines. Baby sea lions are good at detecting mines because of their size. California sea lions, while they don’t possess sonar capabilities, have excellent eyesight. The navy also train sharks to detect other ships. Sharks are being considered for future use in the U.S. military. Both California sea lions and bottlenose dolphins are fairly hardy, smart, and very trainable. Russian activities in Crimea now include taking over a Ukrainian military unit made up of bottlenose dolphins. It unclear how the Russian navy intends to use these combat dolphins. 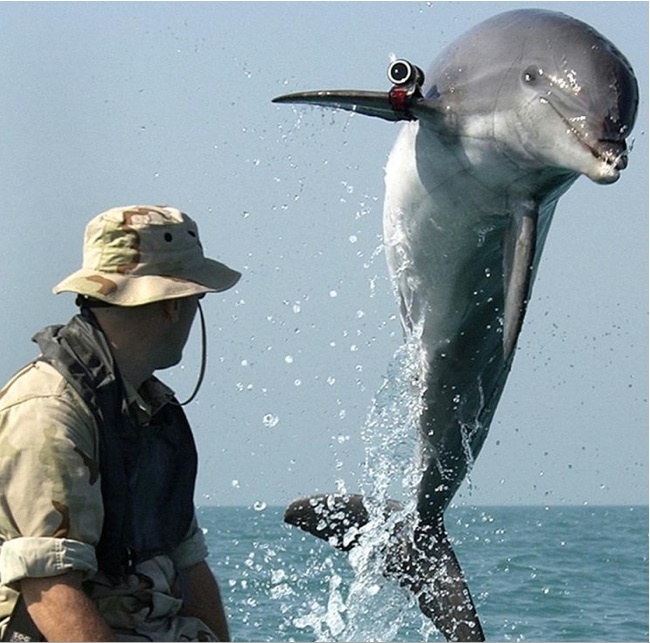 The dolphins are also used to detect underwater mines. Dolphins can be especially effective close to shore. Dolphins, and relatives like killer whales, send out a series of sounds that bounce off of objects. California sea lions, while they don’t possess sonar capabilities, has excellent eyesight. The U.S. Navy uses them to find and retrieve unarmed test ordnance like practice mines. The article states, “It’s unclear how the Russian navy intends to use these “combat dolphins”. Why do you think the Russians refer to their dolphins as “combat dolphins”? Describe a task that the Russian dolphins might perform. In your opinion do you think using sea mammals to help the military is a good idea? Explain why or why not. What other tasks might dolphins and sea lions be used for? The sea mammals used thus far in the U.S. Navy have been dolphins, sea lions, and whales. What other sea mammals might be used for these tasks? What about creatures like sharks, eels, or sea turtles? What are the functions of the Marine Mammal Protection Act (MMPA) and the Animal Welfare Act (AWA)? Directions: Students listen for the correct word or phrase to complete the sentences taken from the video. They are to choose from the options presented. The Navy became interested in dolphins before/after WW II. Medical/medium care is provided for the animals. The medical stuff/staff includes a team of veterinarians from the army. Dolphins also have hearing/herding tests. This program has contributed the most scientific/science information about marine mammals than any other organization. The program helps to definition/define what marine mammals can and cannot do in support of navy operations. Dolphins are trained to signal when they find underwater mimes/mines. Dolphins don’t swim away because they receive fools/food and love. 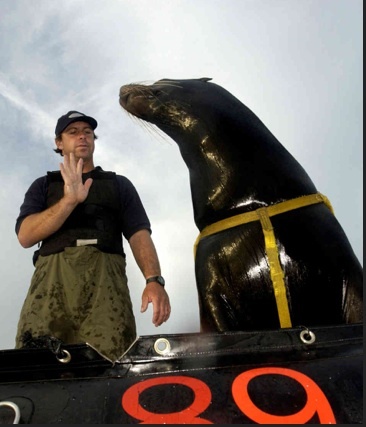 Navy sea lions are used in the recovery of training/trail mines. It takes years to track/train dolphins and sea lions. 1. After listening to this video has your personal idea of sea mammals in the Navy changed in any way? If yes, describe in what way. If no, describe your original opinion. 2. Discuss which comments or ideas you agreed with and which ones you tended not to agree with. Explain why. 3. With your group members, make up questions that you would like to ask the speakers.